Addiction doesn’t usually lead to great things. But legend has it that in 1762, one guy’s gambling addiction led to an invention worth celebrating — the sandwich. According to the History Channel’s website, the tale goes like this: John Montagu, the fourth Earl of Sandwich, requested a meal he could eat without interrupting a long gambling binge. So the house cook served him meat between two slices of bread at the card table. Today, this creation has its own day on the calendar: National Sandwich Day. On Saturday, Nov. 3, these sandwich shops will celebrate the day with some delicious deals. If you’ve already got leftover Thanksgiving turkey sandwiches on your mind, then head over to Capriotti’s this Saturday to enjoy the shop’s signature sandwich, The Bobbie. To celebrate National Sandwich Day, all CAPAddicts Rewards app users can enjoy this Thanksgiving leftover-style sandwich stuffed with homemade turkey, cranberry sauce, stuffing and mayo for just $5. If you’re not a rewards member, then be sure to download the app and sign up before Saturday. 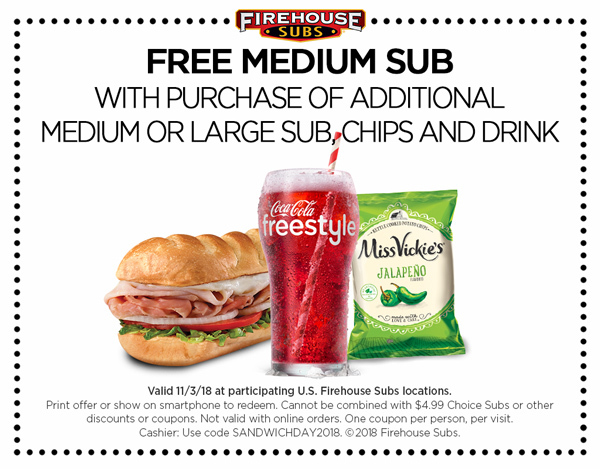 Firehouse Subs wants to celebrate National Sandwich Day by giving you a free medium sub with the purchase of a medium or large sub, chips and a drink. Just head on over to your local Firehouse this Saturday and present this coupon. If you’re a fan of Jersey Mike’s — as in, you follow the sub shop on Facebook, Instagram or Twitter — then you’ll want to tune in for the chain’s National Sandwich Month deals. Throughout November, Jersey Mike’s will post special promotions to its social channels for customers to win prizes. There will be a total of 17 prizes, including Jersey Mike’s gift cards and swag. You can find the official rules here. Anyone who stops by Lenny’s Subs on National Sandwich Day can enjoy $2 off any of the chain’s 20-plus subs. There is no coupon needed, and the deal is available all day on Saturday, Nov. 3. Just a warning: If you’re not hungry yet, you sure will be after watching the sub shop’s National Sandwich Day promotional video from last year. It had me craving lunch right after I had my second breakfast. Stop by your nearest McAlister’s Deli to celebrate National Sandwich Day with a McAlister’s Club sandwich for just $4. This fan favorite is stacked with 13 layers of smoked turkey, Black Forest ham, bacon, sharp cheddar, Swiss cheese, lettuce, tomatoes, honey mustard and mayo on sliced wheat bread. And if you download McAlister’s rewards app, you can enjoy a free beverage with your sandwich. This offer is available for dine-in orders only at participating locations, so be sure to check with your local McAlister’s Deli on National Sandwich Day. This sandwich shop is bringing back Potbelly Perks Week just in time for National Sandwich Day. Each day until Nov. 4, Potbelly is revealing a new deal for Potbelly Perks members, including BOGO deals, free sides and more. Be sure to download the Potbelly app for Android or iPhone before Saturday and keep an eye on the shop’s Facebook page for the National Sandwich Day deal. Schlotzsky’s is celebrating National Sandwich Day with a BOGO deal on all medium sandwiches. If you happen to live near an Urban Bricks, then you can make any half panini a whole for free on National Sandwich Day. Now that you’re armed with sandwich knowledge and know where to get the best deals, it’s time to celebrate National Sandwich Day! And if you’d rather celebrate at home, then check out these sandwich recipes for $5 or less! Jessica Gray is an editorial assistant at the Penny Hoarder and admits to struggling with her own addiction: cheesesteak sandwiches.